This 2011 image provide by CERN, shows a real CMS proton-proton collision in which 4 high energy electrons are observed in a 2011 event. 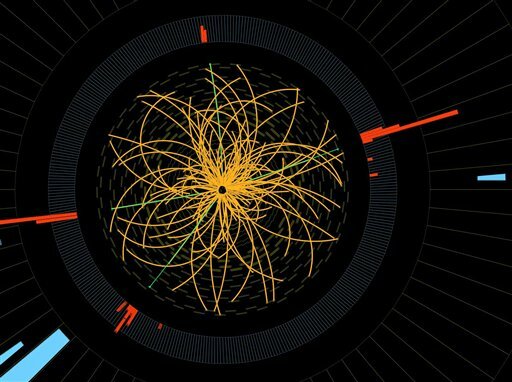 The event shows characteristics expected from the decay of a Higgs boson but is also consistent with background Standard Model physics processes. Then skip more than ten billion years plus half a week. It does not matter where, only know it’s not far. And a woman escaped from the heat from outside. And he stared for a moment then gave her a wink. And she knew, in that instant, he wanted a fight. “Yes, I did,” she replied as she tried not to cuss. “You’re the scientist, aren’t you?” His words dripped with scorn. We test out our theories,” she said with calm pauses. “To understand Nature through natural causes. And no matter how loudly that someone insists. “That’s not true – not today!” his response, so unwarm.